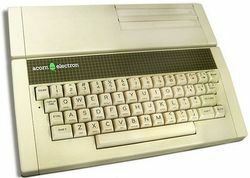 The Acorn Electron is a budget version of the BBC Micro educational/home computer made by Acorn Computers. It has 32 kilobytes of RAM, and its ROM includes BBC BASIC along with its operating system. The Electron was able to save and load programs onto audio cassette via a supplied converter cable that connected it to any standard tape recorder that had the correct sockets. It was capable of basic graphics, and could display onto either a television set, a colour (RGB) monitor or a "green screen" monitor. At its peak, the Electron was the third best selling micro in the United Kingdom, and total lifetime game sales for the Electron exceeded those of the BBC Micro. There are at least 500 known games for the Electron and the true total is probably in the thousands. The ULA controlled memory access and was able to provide 32K × 8 bits of addressable RAM using 4 × 64K × 1-bit RAM chips (4164). The Electron was developed during 1983 as a cheap sibling for the BBC Micro with the intention of capturing the low cost Christmas sales market for that year. Although Acorn was able to shrink substantially the same functionality as the BBC into just one chip, manufacturing problems meant that very few machines were available for the Christmas period - to the extent that some shops reported eight presales for every delivered machine. This was a blow from which the machine never fully recovered, although games sales for it would ultimately outstrip those of the BBC Micro. Following Olivetti's 1985 cash injection into Acorn, the machine was effectively sidelined. With hindsight, the machine was too lacking in RAM (a typical program would need to fit in only around 20 kB once display memory is subtracted) and processing power to take on the prevailing Sinclair ZX Spectrum and Commodore 64. Despite this, several features that would later be associated with BBC Master and Archimedes were first features of Electron expansion units, including ROM cartridge slots and the Advanced Disc Filing System — a hierarchical improvement to the BBC's original Disc Filing System. The Electron is commonly thought of by many retro computer enthusiasts as a failure. However, whilst it may not have been as popular as the Spectrum, Commodore 64, Amstrad CPC or even its own BBC sibling, it did sell in sufficient numbers to ensure that new software was being produced right up until the early 1990s. This meant the Electron had a lifespan not much shorter than those more popular micros and much longer than competitors such as the Oric-1 and Dragon 32. Pages in category "Acorn Electron"
This page was last edited on 25 June 2012, at 09:13.